Scalping is a trading strategy that uses short time frames, such the 1 minute, 3 minute and 5 minute. Traders avoid volatility as a central policy and concentrate on capturing profits from very small price movements. They search for market conditions that permit them to open many consecutive trades in a very short period of time. They aim for small profits of 1 to 5 pips each time. Whereas more traditional strategies seek to open a few trades daily with 100 pip plus profit targets each, a scalper will aim to open many more trades within the same time period but with only a 5 pip profit target each. This means that where the traditional strategy could generate a profit approaching 300 pips daily, the total scalping profit could be near to 500 pips. However, a scalper needs to risk more per position than other strategies in order to generate worthwhile profits. This specification implies that scalpers may risk more than 2% of their account balance per trade which violates the recommendations of many popular risk and money management strategies. Scalping is best performed during those times when Forex is quiet and not volatile. This is because at those times trading patterns tend to be more stable and predictable. Consequently, a popular scalping time is between 5.00pm and 9.00am EST daily. This is because during these hours, the US, Europe and UK do not post key economic data. A scalping strategy requires both a positive win-to-loss ratio and a well-tested stop-loss policy in order to register consistent profits. Consequently, many scalpers opt for small profit-targets, large stop-losses and high win-to-loss ratios. However, this approach often implies that the applicable scalping strategies exhibit poor risk-to-reward ratios. Is it still worth scalping if your strategy possesses a negative risk-to-reward ratio? Yes it is as the following example demonstrates. Imagine that you are scalping using a profit-target of 5 pips and a stop-loss of 100 pips for each trade. This means that your risk-to-reward ratio of 100:5 is very poor. However, assume that your scalping strategy generates a win-to-loss ratio of 98 to 2. You would have achieved a profit equaling to (98*5)-(2*100) producing a total of 290 pips. However, you must be careful because just two additional losses could completely wipe out your profits. Many scalpers base their strategies on breakouts which occur when price emerges from tight trading ranges or consolidation periods. This is because they claim that the design is simple and that they have also recorded good results. A sample scalping strategy will now be presented based on the Bollinger Bands and Relative Strength Index (RSI). This strategy produces better results when price is range trading. 1. Currency pair selected is the EUR/USD. 2. The timeframe chosen is the 5 minute. 3. The main technical indicators are the Bollinger Bands (20, 2. SMA) and RSI (14). 4. The Stochastic Oscillator (SO) is used as a confirmation signal. 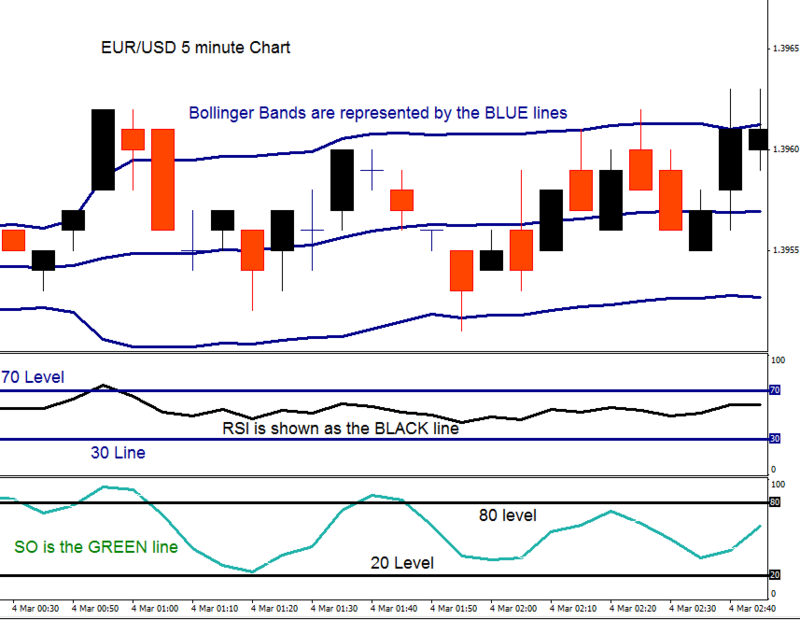 Open the 5 minute EUR/USD trading chart and activate the Bollinger Bands, RSI and SO. The next chart displays an example setup. The top part of the chart displays the Bollinger bands as blue lines. The RSI is shown in the central part of the chart as a black line and its important 70 and 30 levels as blue lines. The SO is located at the bottom as a green line with its important 80 and 20 levels displayed as black lines. Entry conditions are defined as follows. Open a new short when you detect price piercing the upper Bollinger Band and the RSI reading is above 70. The new entry can be confirmed by a SO reading above 80. Place your stop-loss 10 pips above the highest value of the piercing candlestick. Close the position after a candlestick closes beneath the central Bollinger line. 2. Open a new long when you detect price piercing the lower Bollinger Band and the RSI reading is below 30. The new entry can be confirmed by a SO reading below 20. Place your stop-loss 10 pips below the lowest value of the piercing candlestick. Close the trade after a candlestick closes above the central Bollinger line. Use risk and money management concepts to determine your position size so that you do not risk much more than 2% of your entire equity per position. Next, you should utilize top-class methodology to assess and test your new strategy.